SUNY Oswego students will display their artwork Oct. 17 to Nov. 9 in the college's 52nd annual Juried Student Exhibition in Tyler Art Gallery at Penfield Library. This photo from a recent Juried Student Exhibition speaks to the mixed two- and three-dimensional works that the show annually attracts. 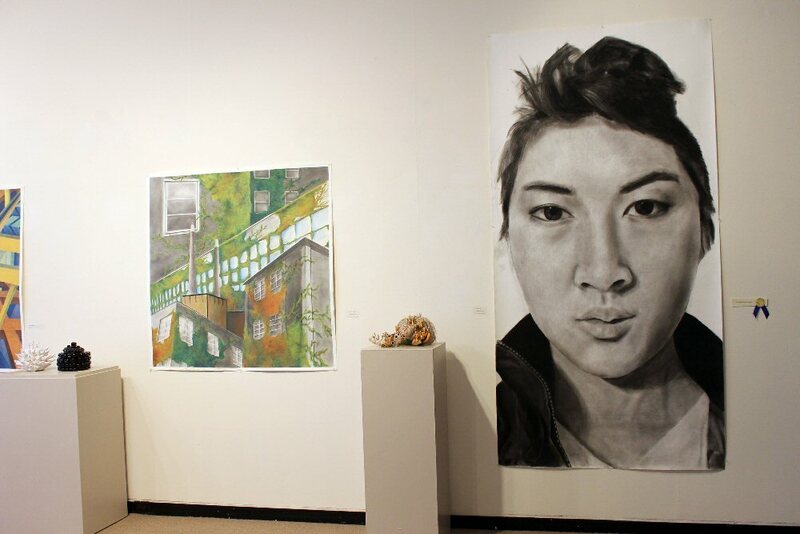 OSWEGO — SUNY Oswego’s 52nd annual Juried Student Exhibition will open with a free public reception for the artists from 5 to 7 p.m. Oct. 17, in Tyler Art Gallery at Penfield Library. SUNY Oswego students will display their artwork Oct. 17 to Nov. 9 in the college’s 52nd annual Juried Student Exhibition in Tyler Art Gallery at Penfield Library. This photo from a recent Juried Student Exhibition speaks to the mixed two- and three-dimensional works that the show annually attracts. Entry is open to any SUNY Oswego student in any artistic medium, whether two- or three-dimensional. The exhibition will run through Nov. 9 in the gallery’s second-floor display space. Jurors are Roy Griswood, a studio artist and retired art teacher from Avon, and Michelle Bersani, who is president of AIGA Upstate, which advances design as a professional craft and cultural force, and an adjunct instructor at Syracuse University’s Newhouse School of Public Communications. The Presidential Purchase Prize — outstanding pieces selected each year for the college’s permanent collection — is among the awards. The Student Art Exhibit Committee organizes the show, and the college’s Student Association supplies funding. Tyler Hall @ Penfield Library is open 10 a.m. to 4 p.m. Tuesdays through Fridays, 10:30 a.m. to 4 p.m. Saturdays and 11:30 a.m. to 4 p.m. Sundays when the college is in session. While donations are appreciated, admission is free; parking on the SUNY Oswego campus requires a $1 permit for those without a current campus sticker. For more information on obtaining a permit, visit www.oswego.edu/administration/parking.